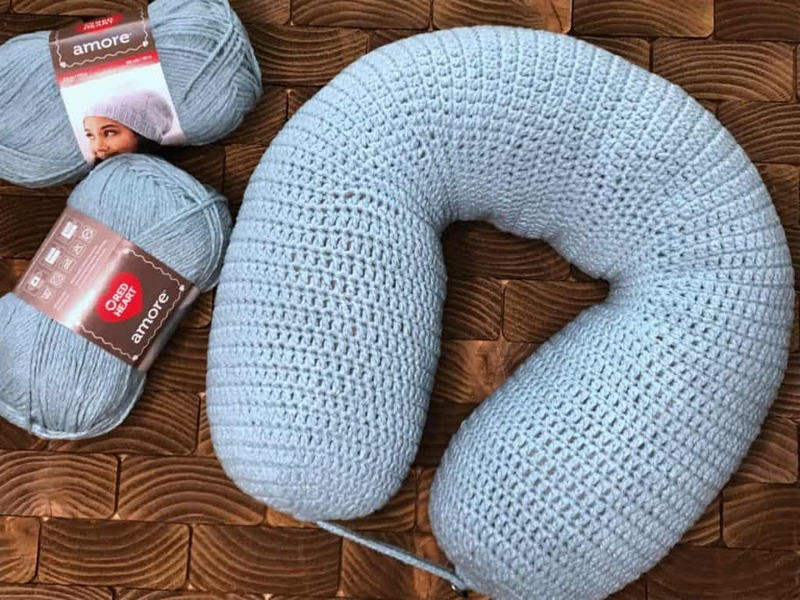 This neck support pillow is similar to my crochet fatigue pillow, so if you’ve made that, you’ll have this one done in no time! I chose to use the Red Heart Amore yarn because it is super soft. 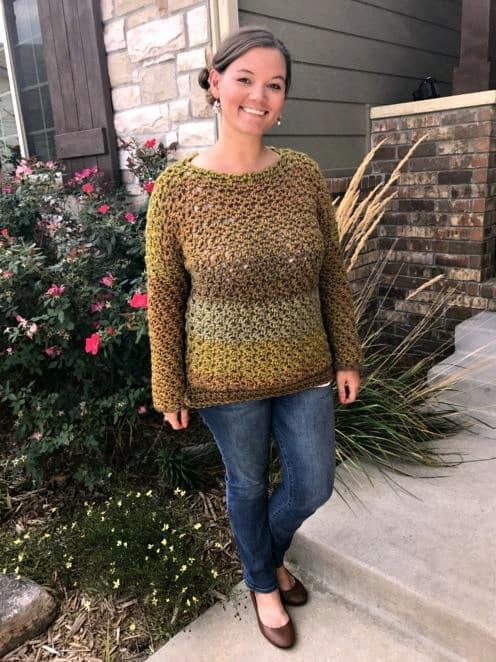 I just know you’ll love this yarn, too! 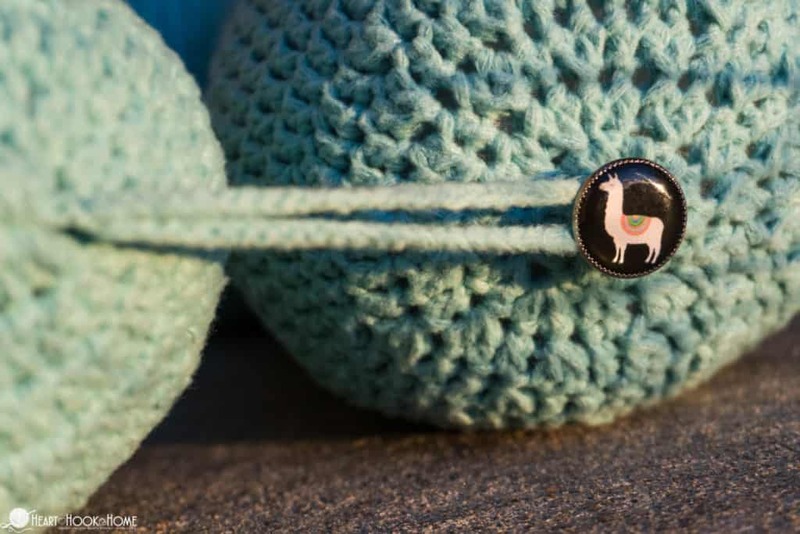 I also chose to use a button I received from Winky & Dutch at Creativation 2019 in Phoenix, an adorable little alpaca! Ahhh, I love it so much! Place first stitch of each row in same as join unless otherwise noted. The slip stitches on row 19 help to keep the seam from turning. Make sure the last stitch in that row goes INTO the slip stitch. Finish stuffing and fasten off leaving a long tail for sewing end shut and adding a button (if holes on button aren’t large enough for yarn needle, simply weave in yarn ends and use needle and thread for button instead). Tightly chain 40 sts. 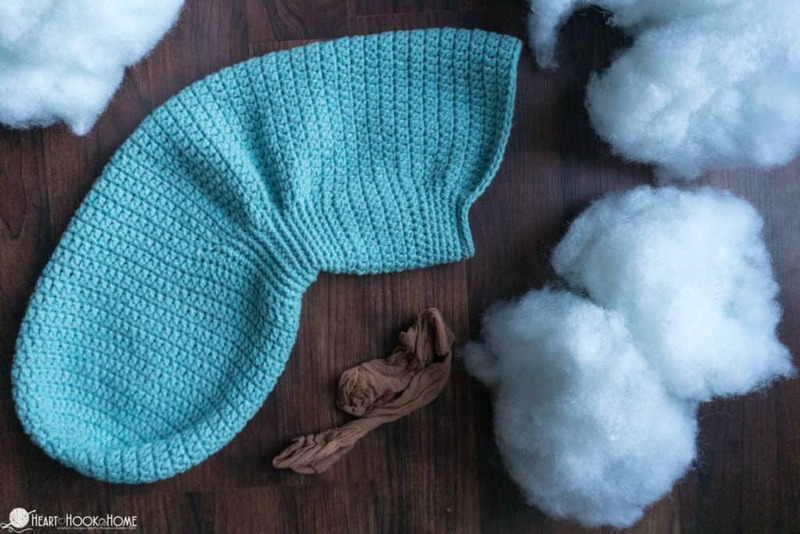 Leave long tails to start and end, so that you can sew them in securely to the center of the magic circle used to start row 1. Undo the strap to wrap the pillow around your neck and you’re ready to go! Ta-da! 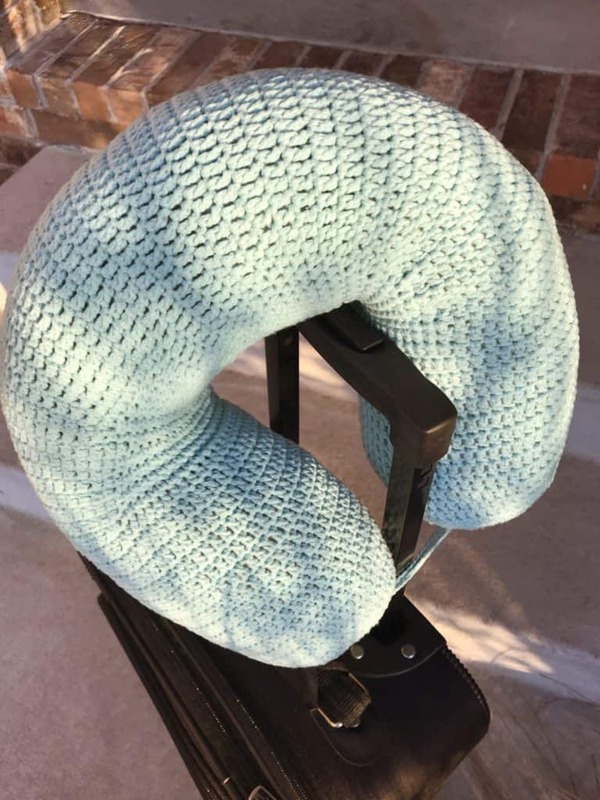 You have a brand NEW travel pillow to use for your next adventure! I love how this travel pillow hangs right on the side of your luggage thanks to the handy dandy strap, and so chic too! Can the cover be removed so you can wash it? Hi ASHLEA. That's a great idea! I'll try one for my next travel and do one more to be a gift . It seems not too much difficult. Thank you for your idea. However, I also want you to share some idea about healthy pillow. 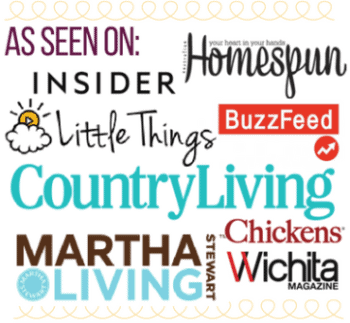 I'm a stomach sleeper and I saw https://www.womenangle.com/best-pillows-for-stomach-sleepers/. I think it might be good for my sleeping. My friend said that it's good result. But I also hear more recommend if you please help me to share your experience. Thank you in advance. 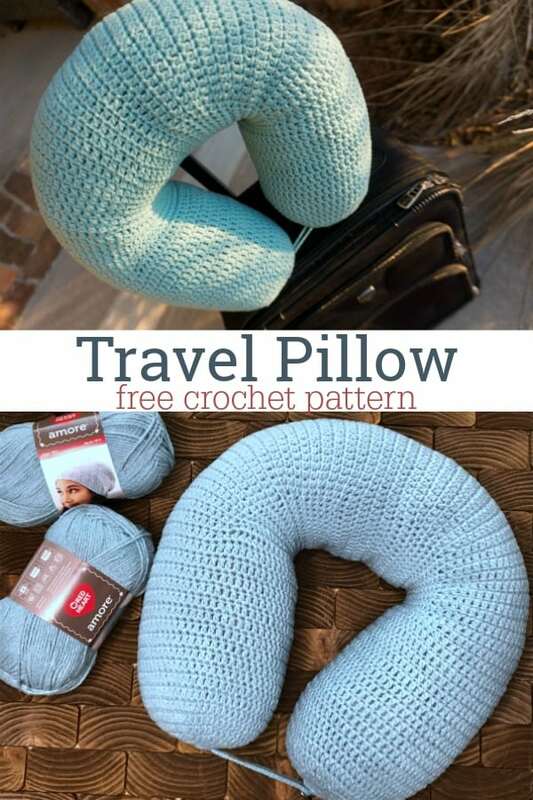 Can a written pattern be purchased for travel pillow? I need help. I am confused. I did rounds 1-21 as instructed then you have after round 21 "Round 21: Ch-1, hdc in same st, sl st in next 26 sts, hdc in next. Dc in next 32 sts. Join to first st with sl st (60) Rounds 17 – 31: repeat rounds 15 & 16: FIVE times **start stuffing**" I am not understanding this. Can you help me Please? Hello Ashlea, I need help with the traveling pillow for row 17-31. I’m not understanding it and looking at the pic below it. Can you please help me understand it. I love all your patterns.